Not as gruesome as some of the other illustrations in this blog. Check out that tail! The Farm Manager peels back the corn husks as I impatiently dance and spin in the front yard. A couple months ago I could bite straight through the husk like it was limp lettuce or a graham cracker. Five weeks ago I couldn’t even bite through grass. I couldn’t bite corn at all. I have never before fully appreciated my rodenthood, but having teeth that automatically grow back is a blessing and a joy. We capybaras are truly amazing, and once again I, Prince Dobalob, sometimes known simply as Sir Dobby, am demonstrating our wonderfulness. I always get a little carsick on the way to the vet. I am certain my faithful followers are wondering what happened to my front teeth, but to be perfectly honest, I am wondering that very same thing. You see, I was unconscious when it happened. The Farm Manager and The Bartender were close by, but there was a solid wall between us. I went behind the wall with two perfect front teeth, and emerged from behind the wall with two fractured upper incisors, my pride and joy, broken but still hanging on. Where is that UNDO button when you need it? And why was I unconscious? Why was I even at the veterinary clinic? And why didn’t the Farm Manager’s lucky hedgehog socks protect me this time? I finished the corn, can we go home now? I am a slender guy, always have been, but I have gradually lost weight -8 pounds- over the last two years. My World Famous Brother, Caplin, had been gradually losing weight before his sudden death in 2010. That’s why the Farm Manager decided it was time for a checkup. My original veterinarian is no longer available, so she decided to break in a new one. The clinic is a beautiful new facility and the veterinarian who would be checking me over was a student of our very own ROUS Foundation veterinarian. I approved the selection, we made the appointment, and I cooperated by getting into my harness, hopping into the car, and making it to our appointment EARLY! For a wild animal, I am a pretty good boy, sometimes. There is a matching video that looks exactly like this photo, but it’s kinda redundant. By now I couldn’t move, and this was only from the tranquilizer! It looks like I am holding onto the ground as if I am on a speeding sidewalk! While the sedative worked its fuzzy magic, we discussed the plan. I would provide a blood sample, they would take three radiographs (which used to be called X-rays), and do a dental exam. Rodents and Lagomorphs are notorious for dental problems, so if we are losing weight, naughty teeth are likely suspects. While we were waiting for the tranquilizing to happen, the Farm Manager asked me to touch my nose to a target so that everyone could have a look at my big beautiful incisors. I would have brushed my teeth if I had known the scrutiny they would receive, but whatever. Grubby gigantic teeth are still impressive. There is a teeny tiny green arrow pointing to the fractured tooth. It broke before this radiograph was taken (duh! ), but after the Farm Manager walked me to the surgery room door. When I was almost too groggy to walk, the Farm Manager coaxed me across the hall, through a door, and then they took her from me. She protested, of course, but clinic policy, yada yada yada, I forget the rest. They returned her to me an hour and a half later, apologizing for the fractured teeth (showing her the radiographs, teeth b, oblique skull b, and lateral skull b) but they had no idea how it happened. And I could go home now. The good news is that, other than the spontaneously fractured upper incisors, my teeth are in great shape, possibly a wee bit of bone loss in the jaw to watch. My blood work is normal, as far as they know (and they don’t know diddly squat) except for the thyroid levels, but what are normal thyroid levels in a capybara? I have cataracts, but I have had those for 5 years. Oh, and I have dandruff. Kind of embarrassing, will have to get rid of the black turtleneck sweaters. This might as well be a video, too. I wouldn’t sit or lay down, but I was swaying ever so slightly. Something is wrong with me when corn can survive being that close to my mouth. So off I went, drunk as a skunk, with my little souvenir bag of hospital discharge paraphernalia, and four wobbly legs. I don’t remember going out to the car. I don’t remember the drive home. I don’t remember getting out of the car. I do remember that EVEN NOW, broken and beaten, I was not allowed to go in through the front door. No, they dragged me around to the servant’s entrance, you know, the door the Farm Manager uses, and locked me in. Not really, but they barricaded me onto the deck so I wouldn’t stumble down the stairs, you know, might break my front teeth or something. But I got to sleep inside, or so they tell me, because I really don’t remember anything that happened on those two days. Lula the chicken kept me company during the day. At first, I didn’t walk around too much because I was so embarrassed about the stumbling, and frankly, I didn’t feel so hot. That Tuesday night of the exam I pushed my way through the barricade at the top of the stars to demonstrate that I could carefully catapult myself down them without mishap. The Farm Manager reluctantly removed both barricades. I schmoozed through Wednesday, and didn’t really start to recover from the anesthesia until Thursday. By Friday, I could almost walk a straight line. Throwing off the anesthetics wasn’t the biggest problem, though. Sorry, Farm Manager. That piece of corn is still way too big! On Wednesday it became clear that I had no intention of eating anything ever again. I was walking better, but I still wasn’t sober, and I was too scared to go to the front yard. I was too woozy to swim or even go into my wading pool. I couldn’t open the kitchen door so I had to stand outside and stare at that wretched tiny doorknob until someone noticed and opened the door for me. I was still interested in my milk, which, by the way, picked up some strange gritty flavors. The only grass I could eat was the most tender slender blades, and it had to be cut for me. No long or coarse grasses, no potatoes, no hay, no corn, no matter how they sliced it. Grass . . . is . . . too . . . long! I wasn’t even eating my poop, and cecotropes littered my pen each morning. At least I was leaving them out there instead of in the kitchen, where I slept the first two nights. It was easy to be a good boy, because when you don’t eat, there’s hardly any poop. Coincidentally, the farm manager just got this fossil. It’s a molar from a Hydrochaeris holmesi. That’s a capybara that lived in Florida over 10,000 years ago! The Farm Manager had been too stunned to check the bag of discharge goodies while we were still at the vet, so she didn’t notice that they sent me home with Critical Care– which no self-respecting capybara will touch- but no pain medicine! The Farm Manager sent The Bartender back to the vet for pain meds, enough to get me through to their Florida abandonment plan Vacation. Thursday I started to eat a little bit more cut grass, but I want to tell all the veterinarians out there that CAPYBARAS WON’T EAT CRITICAL CARE! Kind of a chop-chop salad bar. I still ate my oats, though. Can you imagine getting smacked in the face so hard that your two upper incisors (those big front ones) fracture, but not enough that they fall out? They are kind of dangling there, useless, and your mouth is sore. I actually had cuts in my mouth that the Farm Manager put ointment on for a few days. Nobody knew when my teeth would fall out, but we thought it might take a week, maybe two, for them to grow out to where they would fall out. We heard from other capybara owners that they usually grow completely back in two weeks. The Farm Manager and The Bartender started talking optimistically about their trip to Florida on Saturday, but nobody started packing. And then both my front teeth fell out on Thursday afternoon. In spite of the pain meds, on Thursday I stopped walking around. I sat in one place for a while, then another, quivering my lips and clenching my teeth. The Farm Manager came over to chat and noticed one bloody tooth on the ground. I had vetoed the Florida vacation. Partial upper incisor, with tissue, shortly after tooth loss. You can see that the front of the tooth (lower edge here) is clean, while the back (top edge) shows how the tissue had been the only thing holding my tooth on, for two days. The cutting edge is to the right, broken edge to the left. For the next couple of weeks, the Farm Manager sliced all my food into bite-sized morsels and slipped them into my mouth past the gaping wound where my front teeth used to be. I passed the days eating soft clipped grass, lettuce, and crunchy milk. I couldn’t pick up anything with my mouth, and though my molars were fine, chewing with my strange new (lack of) dentition made my jaw sore, and after a few hand-fed bites, I worked my jaw back and forth and refused any more. She had found the second tooth and I was relieved to have the bloody relics displayed on her desk instead of tormenting my poor beat up mouth. I suffered through another day without pain meds then sent The Bartender out for more. I was on pain meds for a week. It was almost two weeks before I could open the kitchen door. By three weeks I had nearly given up on corn and potatoes, but was eating a bit of grass and lettuce and drinking milk. My eating and pooping started to approach normal volume a month later, but it took five weeks for my teeth to sharpen up enough to bite through corn husks. RIP, whoever you were. Compare this model to the radiograph. Can you see where my teeth fractured, and how tissue held them on a couple days? You can also understand how we were concerned about the unbroken lower incisors, and how they might grow too long before the uppers grew out. The molars are way back, making it difficult to shove apple slices back there. Look at how big the teeth really are! See if you can see the growth buds for the teeth in the radiograph. Finally, compare the fossil molar to these modern molars. Let’s talk about teeth for a minute. I have a creepy decapitated capybara head picture to show you. You can see that there is a big gap between my Bucky Beavers (upper incisors) and my molars. Capybaras have no canines. Let that sink in. Duh, right? My teeth grow all the time, even the molars, and if you ate tough muddy grass, you would want your teeth to keep growing, too. The other big difference is my bony upper palate. Human teeth stick out from gums, too, and have bone underneath to anchor the tooth roots. Because my teeth keep growing, I have no roots, just growth buds located way back up into the bone. And unlike your front teeth that stick out from the gums about the same distance, back and front, my upper incisors are exposed on the top, but underneath they are supported by bone that juts out, and glued to it with soft tissue. My lower incisors kept growing, too! Would they grow too long and hurt the roof of my mouth? Somehow, they didn’t. It did take a while for them to create a new cutting edge with the new upper incisors. It’s hard to bite through corn husks and bamboo foliage- try it sometime! I’ll bet you need scissors, but I have scissors built into my mouth! This video is gruesome, and most of you won’t want to watch it, but it is the only picture that shows how far up my teeth broke off. The bloody places are where the teeth used to be stuck to my gums with soft tissue, the only thing holding them in my head after they fractured. When my teeth grew back, they grew out over the tissue and the undertooth gradually reattached to the gums. It took more than two weeks for my incisors to grow to the end of the palate, and all that time my mouth was too sore to bite things. I tried to eat corn, but it always left bloody spots on the cob. I could get the kernels off with my lower incisors, but I had to bite down with my sore upper gums. The Farm Manager peeled husks off my corn for weeks, and I could still just barely eat it. Ironically, I lost four pounds while recovering from my veterinary exam. Almost four weeks later, my poop volume was nearly normal and my weight loss stabilized. It has been almost 6 weeks, and now I can eat almost everything except hay and the very toughest outer corn husks. Another week of sharpening my teeth on grass, and we’ll see about that! Today’s weight: 115 pounds! That’s up from a week ago, but still below the 117.5 I weighed at the veterinary office on April 12, 2016. What a month you have had dear Dobby! My teeth ache in sympathy for you! I think your diary, dear Dobby, is fantastic. You really have a knack for description. I was right there with you – experiencing every new challenge. 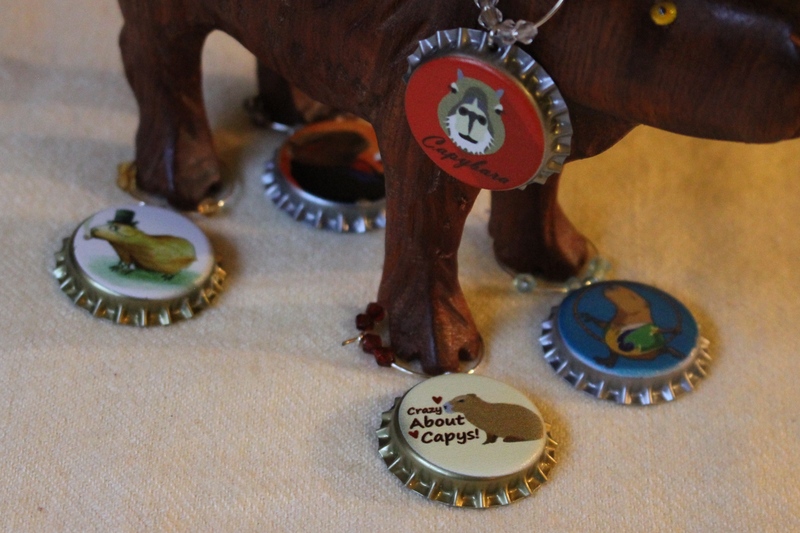 Have you thought about starting a support group for capybaras? Your sage advice and patience with your tooth trauma would lend courage to other capys going through the same thing. You are amazing! I said OMG OMG OMG about a hundred times, reading this. Poor Dobs! Poor FARM MANAGER! I understand why you don’t share the blow by blow, dozens of us clamoring for updates would have sent your stress level through the roof ❤ I am so glad Dobby's okay. Capybaras! The shortcut to grey hair! What a terrifying story! Get back to ur outstanding capybara-style soon, dude! Oh Dobbye! I got so scared at the beginning of this post. I’m SO glad that you are eating your favorite corn again and don’t have to keep drinking the gritty milk. As usual, you taught me A LOT with your incredibly descriptive narrative. Tell the Farm Manager she did a good job helping you sort out your words while you were so groggy! very interesting, I learned a lot….sorry about the toofs! Glad you’re feeling better! Oh my Dear Dobby. My heart goes out to you. What a brave boy you are and to go through the trauma with your teeth!! I was so frighten for you and I am sure your farm manager feels awful about the ordeal you went through. I do hope she will investigate and find answers as why this happen so no other capy child will be hurt this way again. Feel better soon, Dobby. I just happened upon this site….j love Capybaras and your writing is a hoot! Where are you located? I’m in Portland, Oregon. Thank you for such a loving, affectionate dialogue. I hope all’s well now. My heart is full having read this! I am just north of Seattle and my two front teeth are totally grown in, now. I am completely back to biting!